What do you do when you buy a 25 pound bag of bread flour? 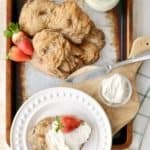 Friends, I’ve been on a bagel kick ever since my friend Sally over at Real Mom Nutrition posted this bagel recipe. On my first two attempts, my experiment to recreate her magic ended in two delicious disasters, definitely not “Pinterest worthy”. But, then I got the hang out it! I kneaded the dough like I was a professional baker, or so I thought! Regardless, a masterpiece was formed. 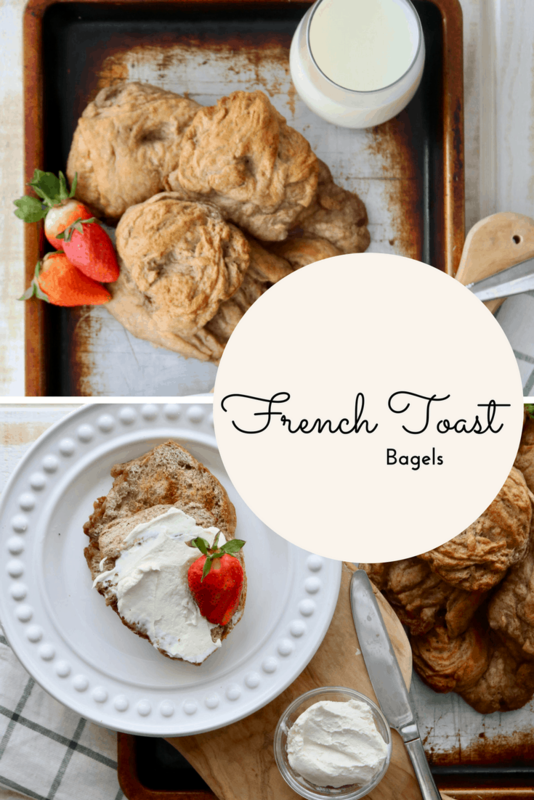 Enter- Homemade French Toast Bagels! Truly, Mr. CEO came up with the idea to make a sweet bagel. He suggested cinnamon raisin but after I had recently finished a Costco size bag of dried fruit far to quickly, I knew another variation was in order! If you’ve got maple syrup, cinnamon, nutmeg and a whole lotta love, then this recipe is for you! But, before you head out to the store, don’t forget, add cream cheese! Just look at this slather, you don’t want to miss out on the goodness of this combination! And, of course, add that fruit! It’s a natural source of sugar that also adds a punch of nutrition too! Or, if you’re more of a jam fan, how about my Chia Jelly or Fig Jam? Pin for later or whip it up now, your choice! 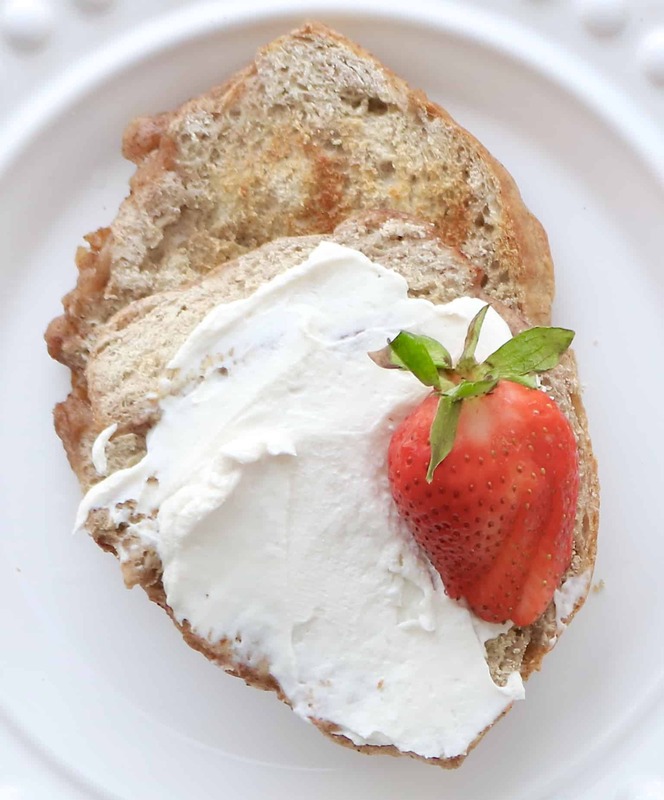 Slightly sweet, totally delicious, these Homemade French Toast Bagels will be the best thing that ever happened to your breakfast menu! Heat milk for 30 to 40 seconds in a large microwave safe bowl. Remove and stir in maple syrup. Whisk in the yeast and let sit for 3 to 7 minutes. In a separate bowl, mix flour, cinnamon, nutmeg, and salt together. Add by the 1/3 cup into the milk mixture and stir together using a wooden spoon. Continue until all but 1/4 cup of flour is added. Note, the dough will hold together but appear shaggy. Next, add in the remaining two tablespoons of maple syrup and stir. Add the last 1/4 cup flour until combined. Remove the dough and place on a floured work surface. Knead dough about 5 minutes, using the extra flour from the surface to prevent sticking. In a new large bowl sprayed with cooking spray, add the dough back in and cover with a lightly damp towel. Place in a warm location for a minimum of 2 hours. When ready to prepare bagels, remove cloth and punch down dough. Remove from bowl and let is sit again for 5 to 7 minutes on a floured surface. Using a sharp knife, cut the dough into 8 equal pieces. Form each piece into a round circle. Place your floured finger through the center of each piece of dough to form the bagel. Note- my bagels were not perfectly round! Use your creativity to make the circle like shape that appeals to you! Set bagels aside while you boil the water. Whisk 2 teaspoons of baking soda into the water. While water is boiling, preheat oven to 425*F and spray a baking sheet liberally with nonstick spray. Gently place a few bagels at a time into the boiling water. Be careful, use a slotted spoon or alternative utensil so you don't burn your hand! Let bagels sit for 2 minutes per side in the water. Remove and place on baking sheet, repeating until all bagels have been boiled. Bake for 20-22 minutes or until surface is golden brown. Remove from the oven and let cool for 5 minutes. Place baking sheet on top of the stove top racks to cool. 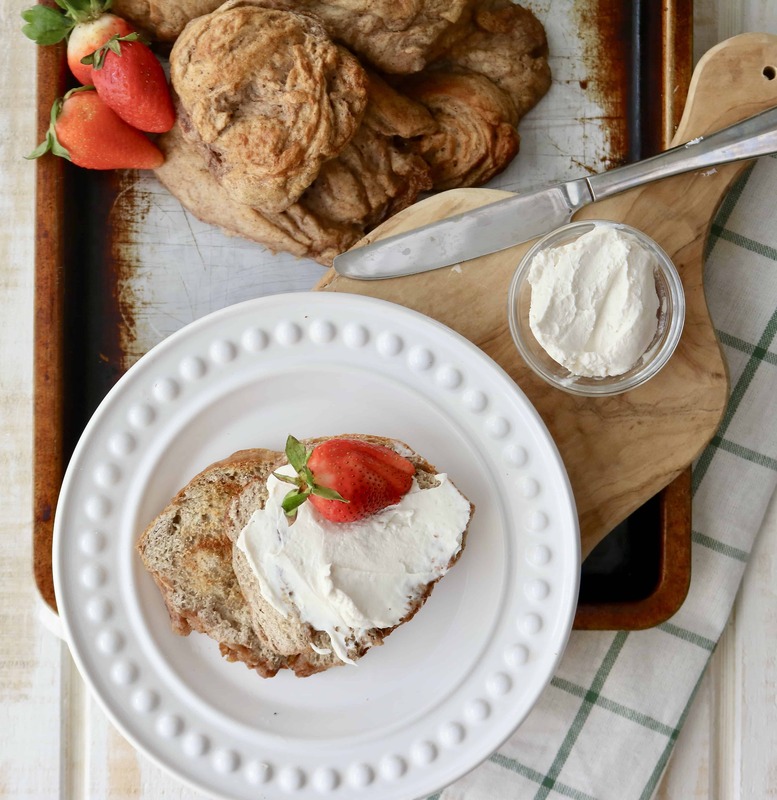 Enjoy with cream cheese, fruit, butter or spread! Store in an airtight bag for up to 2 days on the counter or 1 week in the refrigerator for best quality. Are you a bagel fan? What is your favorite combo?! PS- Are we friends on social? Connect wth me so we can share more #shawsimpleswaps! « Chocolate Ice Cream Cake with a Secret Ingredient! Thanks Sally – full inspiration credit and recipe base to you!! These sound amazing! I’ve been drooling over them since I saw them on Instagram and cannot wait to have some time, hopefully later this week, to make them. Oh yaya! Let me know if you do- thanks for stopping by Sarah! What a fun recipe! I’ve only made bagels once, in my pre-gluten free days, and as I recall, they turned out to be pretty tasty 🙂 My son had a baseball tournament in Santee this weekend, so in-between games I scouted out a gluten free bakery, and enjoyed a super yummy cinnamon roll. Maybe I’ll have to try my hand at a GF version of your cinnamon toast bagels! That sounds delightful!! I bet it was tasty too! Shoot! I meant to give your recipe a 5-Star rating, but my I pad flaked out on me. Will try again!! LOL no worries- it could use a little more EA TLC to get to the full 5!